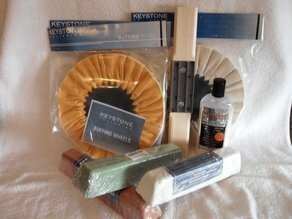 NOTE: YOU WILL NEED A POLISHER WITH A 5/8″ ARBOR SHAFT IN ORDER TO USE THIS KIT. OTHERWISE, SEE ADAPTERS UNDER “ZEPHYR BUFFING PRODUCTS.” THE ARBOR SHAFT OF THE POLISHER MUST BE AT LEAST 3/4″ IN LENGTH. ONE INCH IS PREFERABLE IN ORDER TO HAVE THE BUFFING WHEEL FAR ENOUGH AWAY FROM THE POLISHER. IF THE SHAFT IS LESS THAN ONE INCH WE RECOMMEND PURCHASING THE 2″ EXTENDER KIT FOUND ON PAGE ONE UNDER “ZEPHYR BUFFING PRODUCTS”. THIS HANDY ACCESSORY MOVES THE BUFFING WHEEL 2″ AWAY FROM THE POLISHER. IMPORTANT: ALWAYS WEAR A FACE SHIELD OR SAFETY GOGGLES WHEN USING THIS KIT TO POLISH ALUMINUM. PAY ATTENTION TO MANUFACTURER RECOMMENDATIONS.